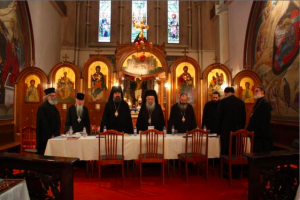 On 15 October 2013, Archbishop Elisey of Sourozh took part in the 7th meeting of the Pan-Orthodox Episcopal Assembly for Britain and Ireland, which was held at the Greek Orthodox Cathedral of St Nicholas in West London. Bishops of the Greek, Russian and Romanian Orthodox Churches discussed a range of subjects including educational leaflets on Baptism and Marriage, coordination of Orthodox prison ministry and pastoral recommendations on partaking of Holy Communion, website of the Sourozh diocese reports. The meeting concluded with a lunch prepared by the parishioners of the Cathedral. Archbishop Elisey was accompanied by Archpriest Joseph Skinner, a member of the Secretariat of the Assembly.